I spoke with Abbot Steve late this morning. He reported that he will be discharged from hospital tomorrow. I did not speak with him for long, as he was surrounded by many members of his family today, including two siblings, in-laws, one of his children, and grandchildren. Abbot Steve's return home is really good news because he very much wants to go home. I will see him in the morning and send an update as I can with more information about his current condition and plans for treatment. Yesterday Abbot Steve said, "It is three weeks tomorrow that I started my new life. I am learning things every day, which is good." That struck me as an astounding statement. I will just say that these last three weeks have been sobering and wondrous for me. 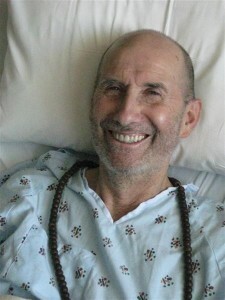 I recognize what a gift Abbot Steve is, and I am trying my best to take care of that gift for the benefit of all beings. Posted in Uncategorized on October 20, 2013 by Mary Stares. Good to see your smiling face, Steve. Love to you and Lane. Hi Abbot Steve - Your face does look so nice. Last night, after a little well being ceremony for you, I was playing with the dog. I felt a sort of kind parent to this dog in a way I had not before. I couldn't help thinking it was your presence coming through. Have never met Steve, but this has flexed my determination to continue sitting ( think I'm sitting too hard! ), and we at Yokoji are honored with your continued contribution. Thank you fer letting me sit with this. What a beautiful smile. I have never met you Steve but my thoughts are with you on this new journey. I am so very grateful for your grace, courage and generosity. Mary, I cannot thank you enough for sending the updates on Abbot Steve. I sat with Steve long ago at his and Lane's home in Mill Valley. Bob and I have you in our thoughts, Steve. Thank you for your continued insights and for being willing to share your journey with us. So good to see you smiling, with clear eyes, open, meeting what comes.